The CBHS has also recently started to publish a series of books on Baptist history. Volume One will be on Canadian Baptists and Public Life (anticipated publication in 2009). Two other volumes are anticipated in 2010 and 2011. Future locations will be McMaster Divinity College (2010) and Tyndale Seminary (2011). In essentials unity, in non-essentials liberty, in all things charity. This quotation, although falsely attributed to Augustine (although I believe he would have agreed with it essentially), is one that is thrown around commonly in Christian circles. The intention is, that in the core essential teachings of Christianity we are to be united, but in the non-essential issues there can be liberty or diversity, and that ultimately in all things we must be charitable to one another. How often though do we truly live this out in the real world? How often do we say or think these thoughts and then turn around and live as all non-essentials are essentials; that those who do not share my particular theology or label can hardly be part of the church? Back in my old days, I often felt that everyone who did not agree with me theologically could hardly be saved. Thankfully the Lord has removed that hurtful thinking and I am trying to look past labels to the theology behind it and embrace the essentials and look past the non-essentials. I had been thinking of this slogan as of late in serving with a non-denominational mission group, Slavic Gospel Association. While we do not have a denominational label, if you looked at our doctrinal statement you would see we are essentially Baptist. Even though we are Baptistic in our theology we recognize that there are those outside of the Baptist camp who are genuine believers, also Baptistic, and conservative theologically. We believe there is a core group of teachings that are fundamental to the very essence of Christianity. We would hold those dearly and fight in earnest for them! But we acknowledge that there are things that fall outside of the essentials of the faith that good men differ on. True believers can have different positions on issues of the end times, the ministry of the Holy Spirit, understandings over election and free will, mode of baptism and many other issues. Does that mean SGA does not have a position on these issues? Far from it! Does that mean that the believers in the former Soviet Union we work with do not have a position on these issues? Not at all! My simple point is that there are many of us who hold to some theological positions very tightly that can never be open to working together with a brother who might not view things exactly the same way. Even more than that, there are those who hold to a particular label that would not consider associating with those who would believe the same as they do yet not maintain their label to the nth degree. Doctrinal precision is extremely important. We must not be sloppy in our understanding of God’s Word. That is why as pastor’s we must be rigorously trained in the exegesis of the Word of God and of Systematic Theology. God spoke to us in propositional revelation for it to be understood. We must be willing to study the whole counsel of God to better understand God and our responsibility to Him. And, I am just as responsible to do this. After years of seminary and personal study I have very carefully held theological beliefs. For instance, I am a 5 point Calvinist. I believe that the Scriptures teach this to be the most accurate expression of the relationship between God and man in salvation. I am a dispensational premillennialist. I believe that this approach to reading the text and understanding the end times is one that is most accurate. Does that mean that we cannot work together with the person who is an Arminian or a postmillennialist? Far from it! For what constitutes a Christian? One who has placed their faith and trust in the Lord Jesus Christ and affirms core doctrinal teaching (i.e., the fundamentals of the faith). That means that there are those I might disagree with in the non-essentials (that which is not required to be believed to be saved) that I can still serve with for the furtherance of the work of the Gospel. Again, even more, there are those who might agree with me but use different labels than I would who would not associate with me because we do not share the same labels. That hurts! A label is only as good as the belief that it represents. If in the process of study we adjust our theology to be better reflective of our thinking, we can adjust the label. But in reality, a label is simply an umbrella over all that we believe. And while it is good to have an umbrella over our heads, it can prevent us from getting close to one another. Picture everyone with their umbrellas over their heads. Some are black. Some are red. Some are big. Some are small. 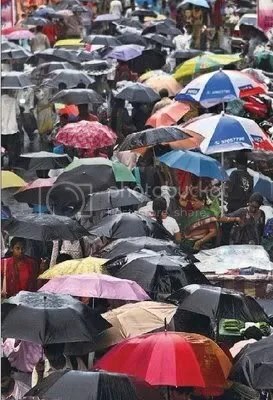 But umbrellas make it difficult for us to come together. Once we lower our umbrellas we will often see clearer what we hold in common and only then can we come closer together. For some reason we wrongly assume that to protect doctrine and the testimony of Christ we feel we must pull in on ourselves and make our camp as small as possible under our label or umbrella. Is it not possible brethren to partner together with other churches who might not agree exactly as you do on every theological jot and tittle for the sake of the Gospel; those who might have a different coloured umbrella? And I must be careful here: I am not advocating embracing unbelief for the sake of being on the same side of an issue. I am not prepared to side with Roman Catholicism on the issue of abortion. But even as I say that are the issues that clear? What do I do if conservative evangelicals are not speaking out on an issue like abortion and the only one who is the Roman Catholic priest? Yes, they disagree with evangelicals on the issue of biblical authority and justification but they solidly affirm the sanctity of life. What do I do then? Is it simply as black and white as many make it out to be? And here is my point. I am seeing it more and more difficult to reach out and connect with people who are so absolutely tied to their rigid umbrellas or detailed labels. For instance, some Reformed churches, regrettably, want to only work with Reformed people who only think like they do. Some Arminian churches only want to work with other Arminians. What happened to the transatlantic revival of the 18th century where Baptists worked with Congregationalists who worked with Anglicans who worked with Methodists and so on for the sake of revival? These people were not advocating different religions. They affirmed the essentials! Even though the believers we work with in the CIS are Calvinistic and that the churches we for the most partner with here in Canada are Calvinistic it is hard to get some people to join with us because we do not dot our “i’s” just as they do. Because we, or those we serve, might not have the same umbrella, some people hesitate to join with us or other ministries. What concerns me is that we as Calvinists are more excited to get together and talk about our theological position which we have done many times before instead of talking about how our theology applies in the real world in the life of the church. How does my Calvinism influence my view of missions? How do we put our Calvinism into practice? But more important, how do we apply all of our theology practically in a worldwide church that is much bigger than just Calvinism? My call to everyone is, remember the church is bigger than you think! And God is calling you to work to further the Gospel all around the world. Therefore, do not only think you must partner with an exact same organization that has the same label as your own before you can help. Look past the non-essentials and partner together with solid Christian churches across Canada to reach out; to see churches planted; to see pastor’s trained; to see men and women saved and added to the church. There is much to do and we need the help of all Christians. We need the help of all believers and churches who are committed to the essentials and will be unified in those essentials for the work of the Kingdom. No one church can hope to reach the entire former Soviet Union. No one church can hope to reach one city, one community, one country, or even the whole world. It will take all of us together. All of us who call on the name of Christ. Is there not a time and place for all those who hold steadfast to the fundamental doctrines of the faith to put aside our theological pride and embrace other brothers for the sake of the Kingdom. Christ is looking for soldiers and warriors. Not everyone in the Army of the Lamb will be exactly the same. Will you take up your standard and sword and fight for Christ together with those who might not be exactly the same as you? The church is bigger than you think and we must all seek to serve Christ by serving our brothers and sisters. Beware your umbrella. Beware the inclination to not embrace your fellow soldier for the mission. When you hold your umbrella it is hard for your fellow soldiers to get in close and protect your back and sides. As the Roman phalanx did centuries before, believers should pull in close and tight to one another despite doctrinal differences that do not make us fundamentally different. We are all fighting for the same army. My wife and I, as part of our nightly devotions, are taking each week to sing and learn a new hymn. This is our first week of doing this. We want to learn more hymns and when we have children to learn them too along with us. The hymn we started with is one that was sung at our wedding. It is a paraphrase of Psalm 23 by Isaac Watts called My Shepherd will Supply my Need. Perhaps you would learn it too as part of your devotions? Hymns teach us so much rich theology and are excellent tools especially for teaching children. Every day at 10 AM, we here in the SGA office pray. We put out a Prayer and Praise item that gives things to pray for each day of the month. Today’s was to pray for our leaders in both North America and in the Commonwealth of Independent States. With the recent election here in Canada and the upcoming election in the United States, I am reminded often of the need for prayer for our leaders. It strikes me as funny, not ha-ha funny, but sad funny, why Christians who have a direct command from God to pray for their leaders, fail to do so. What does Scripture say? I urge, then, first of all, that requests, prayers, intercession and thanksgiving be made for everyone— for kings and all those in authority, that we may live peaceful and quiet lives in all godliness and holiness. This is good, and pleases God our Savior, who wants all men to be saved and to come to a knowledge of the truth. (1 Timothy 2:1-4). Let’s unpack what Paul is saying here. First, he urges all believers to regularly pray for everyone. We know, although we do not practice this, that we as Christians must be in a constant state of prayer. 1 Thessalonians 5:17 tells us to “pray continually” (NIV) or “pray without ceasing” as other translations use. Now, this obviously does not mean that all we do is pray 24 hours a day. We are called to work and to serve God where He has placed us. But we are called to have an attitude of prayer, a desire for prayer, and regular times of prayer. My wife and I have recently been burdened more for prayer. We have taken the opportunity now after dinner to spend time in the Word (of course as newlyweds we are studiyng the Song of Songs), to sing a hymn, and to pray. We pray for each other. We pray for our families. We pray for our ministry. In the morning I pray before I start my day. At night, we pray before bed. Prayer should be continual and constant. At the drop of a hat and throughout our day prayer should drip from our lips as we commune with the Triune God. So, Paul says, knowing that we are to pray continually, calls us to pray for everyone. That is a tall order! How do we pray for everyone? Do we pray “God, be with everyone?” No. God wants us to be more specific than that. In other places He breaks that down further and gives us specific things and people we should be praying for. Paul does that here where he then tells us to pray for our leaders. God, even in Scripture, shows how He uses governmental leaders to accomplish His will. In Isaiah 45:1-6, Cyrus is prophesied to come and bless God’s people. The fulfillment of that was in Ezra 1 where God moved the heart of Cyrus the King of Persia to allow the Jews to return to Jerusalem. God uses governmental leaders, even those who are not believers, to accomplish His will. Thus, we should pray for our leaders! We do this because Paul says it pleases God our saviour who desires all to come to faith. God is pleased when we pray for our leaders because prayer is the ordained means to the end of things. God uses our prayers to accomplish His will. While God has ordained those who will be saved and how they will be used, He has also ordained the means to accomplish those ends; namely prayer. Prayer is that amazing vehicle that not only allows us to commune with the true and living God but allows us the privilege to actually participate in the sovereign work of God in the universe! God uses our prayers to accomplish His will! So, God is pleased when we pray for our leaders! So, today, take time to pray for your leaders. It pleases God when you do so. Pray for their conversion and that through them your lives may be peacable so you can live and worship as the scriptures have called you to do. Pray that God would use our leaders to accomplish God’s will. What a privilege to pray and what a privilege to pray for our leaders! Our Heavenly Father, we thank you for the opportunity to pray! We thank you that through the death of Christ; through His atoning sacrifice, we have access to the very throne room of God to bring our thanksgiivng and petition to you! You have called us to pray and it is through prayer that we are nourished and refreshed. You are the true and living God and you seek to commune with your people. Thank you for the access we have to boldly come to you and speak with you as Moses did; face to face. We pray today for our leaders. We pray that you would regenerate their hearts and that they would come to faith in our Lord Jesus Christ. We pray they would be baptized and be added to your church. We pray that they would seek to be used by you to accomplish your will. We pray they make and enforce laws for the good of the people; that honour you and give us the freedom to proclaim the life changing message of Jesus Christ. We pray for Stephen Harper, our federal leader, Dalton McGinty, our provincial leader, Phil McColeman, my federal MP in Brant, Dave Levac, my provincial MPP in Brant, Ron Eddy, Mayor of Brant, and our other council members. We pray that you would turn their hearts to Christ and that they would lead and govern with an eye to honouring Christ and serving the people. We pray for the upcoming election in the USA. We pray that people would vote intelligently and pick the best person that would serve that country and honour and glorify you. We pray that you would use them to lead and direct the people and that they would create and enforce laws that would do so and yet honour you and what you have revealed to us in your Word. Lord, you are the great God of the universe. Not one square inch of this universe is outside of the lordship of Jesus Christ. We pray that you would work mightily in our world and accomplish your will through our leaders that you have selected. We pray that you would further the work of your kingdom through them and that you would use us, our prayers, and our service, to draw men and women in Canada and around the world to faith in Jesus Christ. We pray for revival; for a fresh outpouring of your Spirit this day and that we might have the privilege of being a part of that revival both here and abroad. Help us to yield to the Spirit and pursue holiness and to do all things to honour you, the Son, and the Spirit. We pray all these things in the name of the great Lord of the universe, Jesus Christ. Amen. If you are interested in attending, please register here. There is no charge! Dr Thomas Ice – “J. N. Darby and the Irvingites.” Sadly Dr Ice was unable to be with us, so this paper is delivered in Crawford Gribben’s dulcet Glasgow tones, rather than Tommy’s Texas drawl. In My Place Condemned He Stood: Celebrating the Glory of the Atonement. J. I Packer and Mark Dever. Wheaton, IL: Crossway, 2007, 188 pp., $16.99, paperback. The doctrine of the penal substitutionary atonement is falling on hard times. Modern day theologians, pastors, and people in the pew view the idea of penal substitution as something completely horrific and foreign to the teachings of Scripture. To think that God had to punish Christ in our place is something that seems strangely outside the teaching that God is love. Yet, at the heart of the Scriptures is the teaching that man has spurned God and now is not able to pay the penalty for his sin and therefore needs someone to pay the penalty for him. Only God can pay the penalty of sin that was committed against God. Therefore Christ must come and take our place. He is our substitute. This is the very heart of redemption. J. I. Packer and Mark Dever have done the church a favour with this helpful collection of pieces on the topic of the atonement. Packer is the Board of Governors’ professor of Theology at Regent College, Vancouver and Dever is senior pastor of Capitol Hill Baptist Church, Washington. Both men have contributed much for the cause of Christ in their years. Now, some of Packer’s best teaching on the atonement, and Dever’s highly acclaimed piece on the topic, appear together in one attractive and well priced book. Crossway should be commended for this release. The genesis of this book comes out of that evangelical powerhouse foursome of Ligon Duncan, Al Mohler, Mark Dever, and C. J. Mahaney. These men are well known individually and as those at the heart of Together for the Gospel. Commenting on how important Packer’s writing on the topic of the atonement had been in their lives, it was thought that these works needed to be released again for a new generation. Dever approached Packer on this and Packer agreed as long as Dever’s article on the topic from Christianity Today was also included. He agreed, and In My Place Condemned He Stood was born. Packer introduces the book with a brief look at atonement, penal substitution, and redemption and sets the stage for the other treatises in the book. In “The Heart of the Gospel” (originally a chapter from Packer’s Knowing God) looks at the issue of propitiation (“averting God’s anger by an offering”) sets the stage for the need for penal substitution with the reality that God is angered at man and that anger needs to be appeased. It needs to be atoned for. Packer goes on in “What Did the Cross Achieve? The Logic of Penal Substitution” (originally the Tyndale Biblical Theology Lecture in 1973) to survey approaches to viewing the death of Christ in the church. He concludes, that penal substitution is necessary and logical, because God’s wrath needs to be appeased. Therefore the cross is directed at propitiating God first, and then second turns humankind toward Him. Penal substitution is completely logical when you look at the reality of sin and the sinner’s relationship to God. Next Dever looks at criticisms of penal substitution in “Nothing But the Blood.” Dever’s chapter is quite important to the book as a whole because it deals with the current issues and debates surrounding the atonement. It is good to interact with opposing views and identify where the current trends are going on a theological issue so one can better present the Scriptural teaching. Finally, Packer’s “Saved by His Precious Blood: An Introduction to John Owen’s The Death of Death in the Death of Christ,” is probably worth the price of the book. This was originally written as an introduction to Owen’s book on the topic of limited atonement. Owen, and Packer, defends vigorously the teaching that Christ died for the elect. This article by Packer has been used in many a questioning mind to bring them fully over to the Calvinistic understanding of the atonement. It is a fitting look at how that penal substitutionary atonement is applied. Dever and Packer conclude by expressing the reality that to be Christ-centered one must be cross-centered. Ligon Duncan rounds out the book with annotated reading lists on the topic of the atonement. At the heart of the ministry is the atoning work of Christ. As Paul said, we preach Christ and Him crucified. No pastor, ministry leader, or Christian for that matter, can afford to not think through the scriptural teaching on the atonement. Particularly we need to see the reality of the death the unbeliever is in. Our synergistic approach to salvation, so prevalent in today’s society, needs to be eradicated from our thoughts. Dead means dead. The unbeliever has no power to save himself or even to participate with God in saving him. He is dead in trespasses and sins. He has angered God and that anger needs to be appeased. The ultimate sacrifice necessary to appease the anger of an infinite God is in the matchless death and resurrection of the Lord Jesus Christ. He stood in our place condemned so we could be redeemed. He paid the penalty in our stead. This is the very foundation of salvation. These issues are not abstract and scholarly. They are at the very heart of the Gospel message. As the Bliss wrote in his hymn, “Guilty, vile, and helpless we; Spotless Lamb of God was He; ‘Full atonement! Can it be? Hallelujah! What a Savior!” Hallelujah for the great lamb of God who takes away the sin of the world through his death on the cross. Praise the Lord that He stood in my place condemned so I might have salvation. Packer and Dever have done an incredible service to the church. All believers no matter the theological persuasion need to read this book and meditate on the reality of the penal substitutionary atoning work of Christ. Cannot be more highly recommended! You are currently browsing the Working out Salvation with Fear and Trembling blog archives for October, 2008.